This is a woman with with talent in spades! I've always admired knitters, it's just one of those skills I've never been able to master. In fact, anything involving fabric, thread, yarn or a sewing machine can be counted on that list. Maybe it's because of this that I have such a great appreciation for others who have this talent and make beautiful, eye-catching pieces. Barbara over at Eco Chic Hand Knits is one of these people. I'm particularly infatuated with her beautiful nesting bowls. Along with being a talented knitter, Barbara also is an advocate for the environment! All of her products are made with 100% organic cotton yarn which is very environmentally friendly. And, it says on her profile that she tries to cut down on my waste as much as possible and saves all scraps of yarn to use for other products. On this same thread, she also only uses packaging made from recycled materials and suggests to others that they are welcome to reuse them if they can. Even her business and thank you cards are made from recycled products! She has beautiful pieces in her shop and does custom orders, so if you're looking for something to brighten up your home or give as a gift that's both unique and environmentally friendly, I'd definitely suggest taking a browse around her shop. 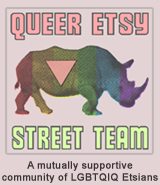 YOU CAN CLICK ON THE PICTURE ABOVE TO VISIT ECOCHICHANDKNITS' ETSY SHOP OR, IF YOU PREFER, CLICK RIGHT HERE. 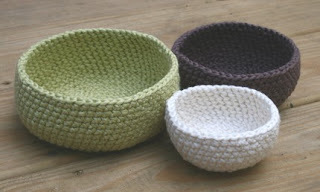 Oh, I love EcoChic bowls, too!